Alright, here it is! October 1 and time to unveil my fall wardrobe. My capsule wardrobe is quite small, when I return to work in November I’ll only be wearing “regular clothes” half of the time. On top of having to purchase all new sized clothing, I have to purchase all new scrubs for work so I chose to keep my capsule small this year to save some money to purchase scrubs. Finally shoes all purchased from Payless Shoe Source for fall. Anything with an * beside is purchased for the fall capsule. Not shown: 1 winter jacket (it’s gonna start snowing in not to long so even if this is my “fall” wardrobe, I need a winter jacket! ), 1 brown faux leather jacket, 1 black blazer, and 1 pair of brown boots. All of the items not shown I’ve owned for at least a year, more like 2. So that brings my wardrobe to 23 pieces and they are pretty straightforward, but I’m excited to be OK with what I have right now. I know that the more I do this the more I will learn about myself and my style, then with each new season my wardrobes will only get better! Are you joining in on the capsule wardrobe fun? Have you purged your closet lately or shopped your closet?? Alright, I’m so happy and relieved to say my fall capsule wardrobe is complete! I’m not going to show everything right now because occasionally I’m going to post my outfits and you’ll see it all there. I thought I’d go through a bit more detailed process of how I decided what I was going to buy and how I went about shopping. 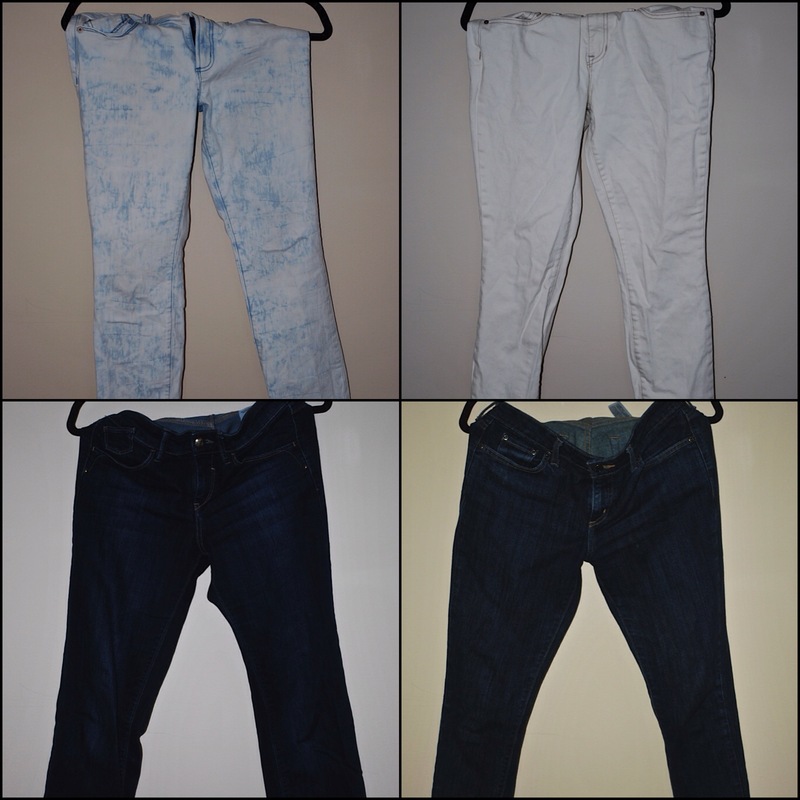 For pants: I had five pairs of pants in my closet, 4 jeans and 1 pair of linen pants. One pair of jeans I bought because they were $10 and fit pretty great but I’ve since realized I actually don’t like them, so they are going into my garage sale pile for next year. The linen pants I’ll put away for next summer. That leaves me with 3 pairs of pants, ideally I’d like 5 so I needed to buy 2. For shirts: I had 13 shirts in my wardrobe in the summer. I basically got rid of the really bright colored ones, the sleeveless ones and a couple that I had bought that I ended up not really liking. Sales kill me, I’m learning to be far more intentional with my purchases and thinking through it a little more wisely. So I got rid of 6 and kept 7 and I want 10 so I needed to buy 3. 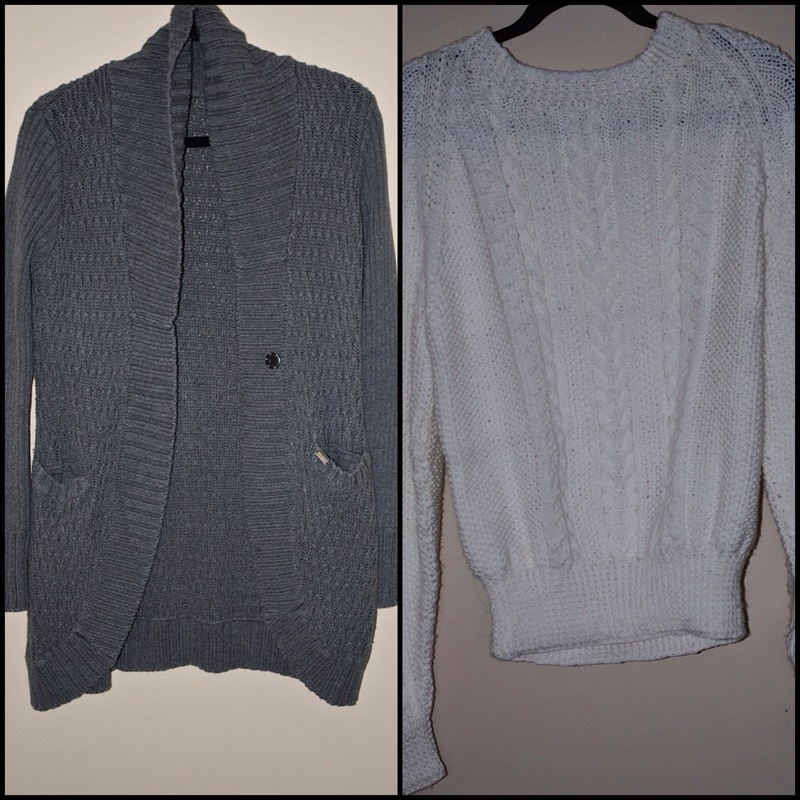 For sweaters: I had 1 cardigan in my wardrobe already and I want 2 so I needed to buy one. For shoes: this subject is a disaster for me. I’m a tall girl with really large feet and there is nothing worse for me than shoe shopping. I hate it so much that when I do find a pair of shoes that fit me I’ll buy them and wear them out completely. The last time I bought a pair of shoes was 3 years ago! My husband started threatening that he wouldn’t go out in public with me unless I bought new shoes because mine were so worn out. So basically I was starting from scratch, although I had one pair of wedges I liked and a pair of boots that will do me another season. So there’s the break down of how I decided what I needed. 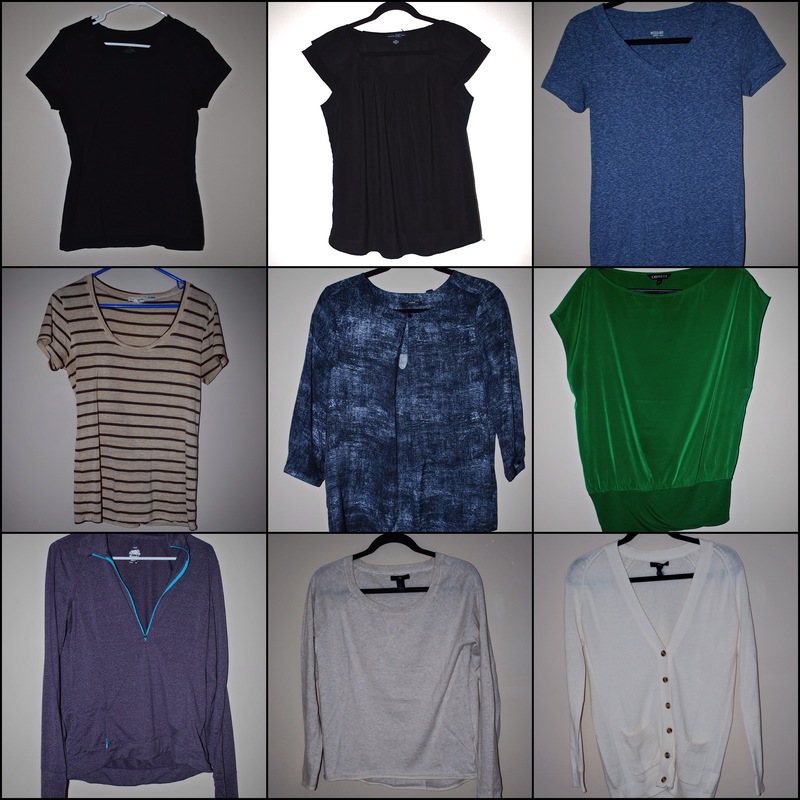 I had bought one shirt last week from Mexx for the fall wardrobe. My budget for the wardrobe was $150 and that includes the shoes. So off I went to Banana Republic and Gap, they are free standing stores right beside each other and are both outlets. I promised myself that I wouldn’t buy something simply because it was a shirt on sale! In both stores I tried on about 10 items. I was proud when I walked away from really great deals at Banana Republic because they weren’t items I “loved.” Then I took my time walking through Gap and picked out a lot of stuff that were neutral and that I thought would make great editions to my wardrobe, in the end I had 1 pair of jeans, 2 long sleeve shirts and a cardigan that I really loved, I also picked up a onesie for my son to complete my 5 items to get an extra 15% off. After all was said and done I paid $90 and saved $120! I was pretty impressed with myself! Next stop Payless Shoe Store, I didn’t have much hope of finding anything but was VERY pleasantly surprised to discover a brand of shoe that makes cute shoes in my size that aren’t extra wide. I’m not sure why, but I think shoe companies think that women with big feet must also be large people because most shoes that are 11 or 12’s are also super super wide, so even if they are long enough they don’t fit. On top of being wide they are never cute. But I actually had a hard time walking away with just 4 pairs! I spent a long time debating which 4 I was going to buy, the sale was buy one get one half off and 3/4 of the shoes I bought were already on a wicked sale. In the end I bought 2 wedges and 2 flats for $75 and saved $81! Guys, it was a GREAT day. I was over budget $15 and still missing one pair of pants but I’m counting it a success. I do have another coupon for $25 off a $50 purchase at Gap Factory in October and there was another pair of jeans I really liked so I may go back and pick them up in October. I’m so excited about my wardrobe and to challenge myself to create outfits out of the little that I have. I’m also excited to share that here! I’m going to be completely honest here. Fashion is SUPER hard for me. I love it and hate it all at the same time. I love pretty things (who doesn’t) but have no idea which pretty things will actually look pretty on me. More often than not you’ll find me in a plain tee with a pair of jeans. There are a few factors that come in to play in this area. First off, I’m really broke which equals really cheap which leads to clothing I think I really like but I would say 80% of the reason I really like it, is because it’s really cheap. I don’t think spending money on clothing is a bad thing, I’m actually envious of the people who can spend that $100 on a good pair of jeans and not think twice about it. I realize that if you spend money on good quality it pays off, BUT I just can’t make clothing my priority because the money just isn’t there, literally. The second factor is that I lost 75 pounds (!) and have no idea how to dress my new body. Going from a size 14-16 to a size 6-8 is drastic and things look different now. Doing this capsule wardrobe idea has really challenged me in a good way (to read more about this visit my Capsule Wardrobe page). It’s made me actually THINK about the way I want to present myself. It’s made me be very intentional with my clothes and actually research BEYOND just what’s on sale, and I think I’m going to be OK with not just shopping sales. I’ve put this post off for a week because it’s been so challenging, but I figured if I write about it now it might help me to solidify what I really want to do for this fall wardrobe. So here’s what I’ve done so far and what I plan on doing this week. I Googled fashion style examples to see if I could get some help with what type of fashion style I am. It led me to this site, I took the quiz and it showed that I have a classic style. Reading through the description I definitely agreed with it. Sometimes I’ll buy bright colors but often regret it when I buy too much bright colors because they are hard to mix and match. So this season I’m going for mostly neutrals, blacks, browns, greys, and whites. I’ve stared at my current wardrobe, and thought about it long and hard. Some things I would like to get rid of for the season, like jeans I bought because they were a wicked deal but actually don’t really enjoy wearing. However there are so many of these items that it’s just not feasible at this point. Next season when I’m back to work I’m hoping to be able to weed out a lot of those items but for this season I’m recycling a lot of what I bought for summer that will work for fall. I’ll do a detailed post on what I’m keeping and getting rid of a little bit later. I scoured Pinterest and pinned anything that I thought fit the classic style and that I could see myself wearing. After pinning many many things I went through that board and narrowed down exactly what items of clothing I thought I would need this fall. From that I created a shopping list that was pretty specific (black leggings, skinny jeans, brown cardigan etc.). I’ll do another detailed post on this list as well. I haven’t done this yet but hopefully will find some time this week. Go SHOPPING! I need to be strategic with the day I go shopping. I’ve realized that I don’t really enjoy shopping with anyone, I’d rather go alone and I have to be in the right mindset. I actually don’t like shopping, it exhausts me and I’m definitely not a window shopper. When I shop I need a list and I have an exact agenda, I go to the mall for that reason and that reason alone. I don’t linger, I don’t try on what I don’t think I’ll like, and I don’t browse just to see what’s there. So if I go into H&M, I’m going specifically to try on X,Y, and Z. Browsing websites is useful for this. So expect to see more on my capsule wardrobe this week!